Chocolate, specifically its main ingredient cocao, is known to have health benefits. It is one of the most popular food today. On average, a person would consume ten pounds of it annually. Although, scientists look at a category of flavonoids called flavonols as the reason for its healthy properties, the exact reason why has been unknown for years. Scientists now believe they have pinpointed the reason for this in findings that. were unveiled at the 247th National Meeting & Exposition of the American Chemical Society (ACS). They explain that the abundant flavanols in cocoa such as catechin, epicatechin and polymers are consumed by certain bacteria in the stomach and convert it into anti-inflammatory compounds that are good for the heart. Flavonoids (the main category of flavanols) can be found naturally in fruits, vegetables and beverages (tea, coffee, dark chocolate, beer, wine and fruit drinks). Flavonoids possess beneficial effects on human health as they are said to have antiviral, anti-allergic, antiplatelet, anti-inflammatory, antitumor and perform antioxidant activities. The health benefits of eating dark chocolate have been extolled for centuries, but the exact reason has remained a mystery –– until now. Researchers reported here today that certain bacteria in the stomach gobble the chocolate and ferment it into anti-inflammatory compounds that are good for the heart. Their findings were unveiled at the 247th National Meeting & Exposition of the American Chemical Society (ACS), the world's largest scientific society. The meeting, attended by thousands of scientists, features more than 10,000 reports on new advances in science and other topics. It is being held at the Dallas Convention Center and area hotels through Thursday. "We found that there are two kinds of microbes in the gut: the 'good' ones and the 'bad' ones," explained Maria Moore, an undergraduate student and one of the study's researchers. "The good microbes, such as Bifidobacterium and lactic acid bacteria, feast on chocolate," she said. 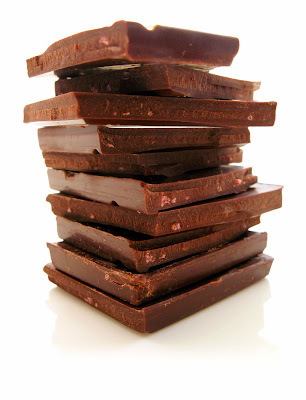 "When you eat dark chocolate, they grow and ferment it, producing compounds that are anti-inflammatory." The other bacteria in the gut are associated with inflammation and can cause gas, bloating, diarrhea and constipation. These include some Clostridia and some E. coli. "When these compounds are absorbed by the body, they lessen the inflammation of cardiovascular tissue, reducing the long-term risk of stroke," said John Finley, Ph.D., who led the work. He said that this study is the first to look at the effects of dark chocolate on the various types of bacteria in the stomach. The researchers are with Louisiana State University. He explained that cocoa powder, an ingredient in chocolate, contains several polyphenolic, or antioxidant, compounds such as catechin and epicatechin, and a small amount of dietary fiber. Both components are poorly digested and absorbed, but when they reach the colon, the desirable microbes take over. "In our study we found that the fiber is fermented and the large polyphenolic polymers are metabolized to smaller molecules, which are more easily absorbed. These smaller polymers exhibit anti-inflammatory activity," he said.